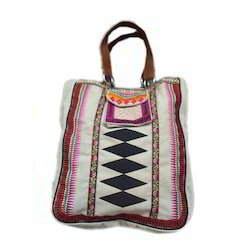 Pioneers in the industry, we offer large embroidered bag from India. Backed by our flourishing business processes, we are able to supply a flawless quality range of Large Embroidered Bag. Enhanced with artistic work and design to make it an elegant in gifting, offered bag is designed using the finest quality raw material and modern technology in line with set industry norms. As per the client specifications, we offer this bag in varied sizes, shapes and colours. Looking for Large Embroidered Bag ?